Civil society groups are calling for Laos’ Don Sahong hydropower dam project to be discussed when Southeast Asian leaders meet with President Barack Obama next week at the Sunnylands estate in Rancho Mirage, California. The unprecedented U.S.-hosted ASEAN summit comes amid increased efforts by the Obama administration to increase its security and economic presence in the region, where it wants to balance the influence of a rising China. Environmental campaigners in Cambodia said the two-day meeting, which kicks off February 15, provides members of the Association of Southeast Asian Nations the opportunity to appeal for American assistance or mediation on the awkward issue of hydropower on the Mekong River, the lower reaches of which have not yet been dammed. Nongovernmental organizations expressed this hope to U.S. Secretary of State John Kerry on his visit to Cambodia last month. 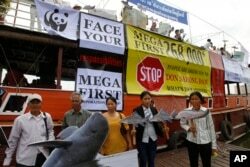 FILE - Cambodian nongovernmental organization activists hold a cutout of a Mekong dolphin, left, and cutout of other species during a protest against the proposed Don Sahong dam, in Phnom Penh, Cambodia, Sept. 11, 2014. Of immediate concern for these groups is the plan to construct the 260-megawatt Don Sahong facility at a site in southern Laos, just 1.5 kilometers from the Cambodian border. The governments of both Cambodia and Vietnam have raised concerns about the potential impacts downstream, where millions of people rely on the Mekong’s fish for protein. Chhith Sam Ath, country director for the World Wildlife Fund in Cambodia, said dam construction should at least be suspended while Lower Mekong countries discuss the issue. "Cambodia has Irrawaddy dolphins in the Mekong, which may swim back and forth between Cambodia and Laos," he told VOA Khmer. "It also is one of the countries in Asia that has the most fish. These fish contain protein that supports millions of people." Beyond providing basic sustenance for locals, the Mekong River draws tourism that, he said, could be threatened if damming disrupted the river’s delicate ecosystem. "We are worried that the Don Sahong dam will affect our efforts to protect dolphins, as well as about fish migration, water quality and the livelihoods of millions of people," Sam Ath said. Laos already is constructing the Xayaburi dam along the main body of the Mekong River, where it has proposed another 10 dams. Laos has pushed ahead with the hydropower projects, despite opposition from the downstream countries. While official protests have been lodged through the Mekong River Commission, a multilateral body formed out of a 1995 agreement among Laos, Thailand, Cambodia and Vietnam, another multilateral mechanism might hold more hope for an effective intervention over Laos’ hydropower plans. Founded in 2009, the U.S.-funded Lower Mekong Initiative targets improved cooperation among the countries of the subregion, while promoting environmental conservation of Mekong River wildlife and clean water. "We are working diligently to develop sustainable development practices on the Mekong River," Kerry told reporters in Phnom Penh on January 26. "And we have the Lower Mekong Initiative, which focuses on many of these issues." According to the U.S. State Department, the initiative’s programs include the development of a tool to model the impacts of climate change and other environmental challenges in the subregion. Tek Vannara, director of the NGO Forum on Cambodia, said that while 60 million people rely directly on the Lower Mekong, 300 million live in its periphery and should therefore be concerned about the potential impacts of dams such as Don Sahong. The U.S. government, he added, could use the Lower Mekong Initiative to play an important role in creating an atmosphere in which the countries along the river can talk constructively about the dam. "We want the program to focus on energy development and environmental protection," he said. "We want [the U.S.] to give us technical and financial support, or a mechanism to preserve the Mekong River, because protecting water resources and using water with equity can guarantee food security in the Mekong region." Luy Rasmey, executive director of the Culture and Environment Preservation Association, which is based in Stung Treng, the Cambodian province opposite the Don Sahong dam site, told VOA Khmer that local communities’ concerns should be raised at next week's high-level meeting. "[The dam] would have a lot of impact on the people who are relying on the river resource," she said.